We Canadians love coffee — our per capita consumption is one of the highest in the world…..and growing. So, we thought it would be fun and insightful to learn more about Canada’s coffee habits. In this quick survey, run on Twentify’s mobile insights platform, we dig into what makes a great coffee shop through the eyes of our user base from coast to coast. Environmentally friendly with recycle and waste bins. Quality/ price ratio is the best! I grew up eating Timbits and donuts from Tim Hortons, so when I started drinking coffee it was a natural selection for me. They have many locations which makes it easy to grab a coffee or tea. Eclectic collection, inherent Canadianness, interesting clientele from all social strata. But, let’s not count out the others. Starbucks garners a strong share across the country and McDonald’s is working hard to secure a leading spot with the McCafe brand, just behind Second Cup for third spot. 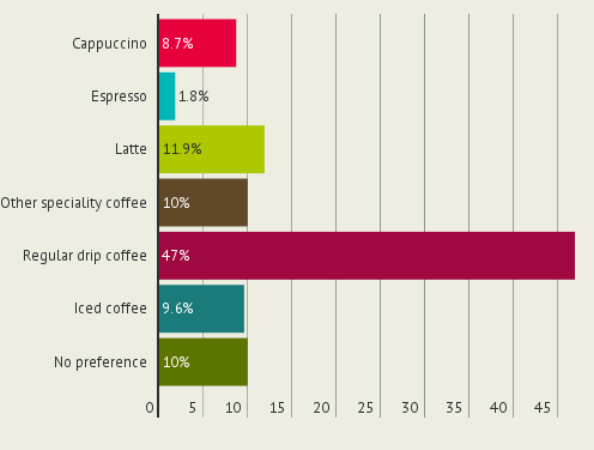 What’s interesting though, when combined, is the rise in popularity of local and regional coffee shops. We received lots of stories selling the benefits of local and regional players like Calgary’s Phil & Sebastian, Nova Scotia’s Anchored Coffee, and Ottawa’s Bridgehead Coffee. La Barista Cafe in Toronto because they use biodegradable products, offer gluten free cupcakes and have great handcrafted coffee. Almond Butterfly in Toronto because of the friendly personal touch, good relationship with baristas, lots of seating by windows, comfy chairs for visiting. Maha’s in Toronto- a local community coffee shop with great breakfast and brunch options. Authentic Egyptian cuisine. British café in Aylmer, Ontario, because it’s beautiful inside with a lot of cachet. The staff is friendly and the coffee especially the espresso is excellent. They offer open mic on Thursday night and create a sense of community in a small town like Aylmer. Regular drip, or Cappuccino? What are we drinking? What’s interesting again is that our taste for regular drip coffee is changing. While 47% most often order a regular coffee, an almost equal amount are choosing typically more expensive specialty drinks like Lattes, Cappuccinos, Espressos, Iced Coffees and others. 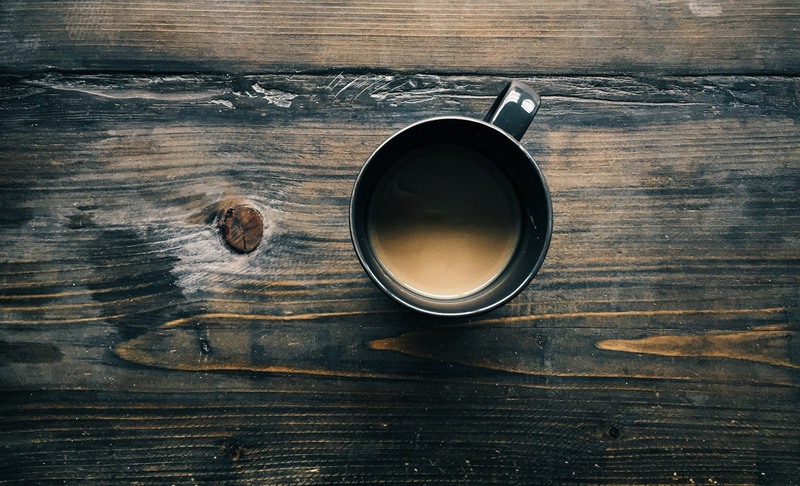 Many days, a cup of coffee is something to fuel your way to or through work or some other activity — 70% of respondents have their coffee to go. Many Canadians will relate to this comment ‘Getting coffee on the way to work or school has truly became an integrated part of my daily routine.’ The other 30% are perhaps enjoying their coffee with friends or colleagues by responding that they get theirs in-store. 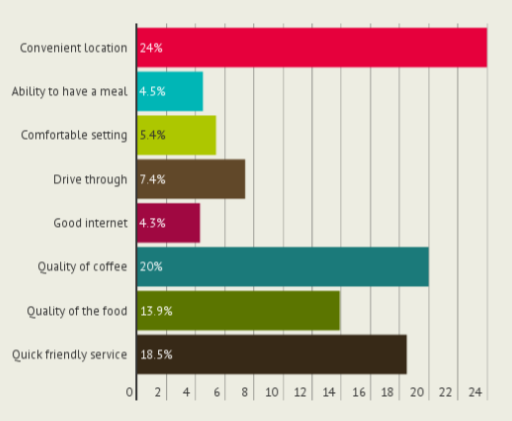 What’s important to you in a coffee shop? 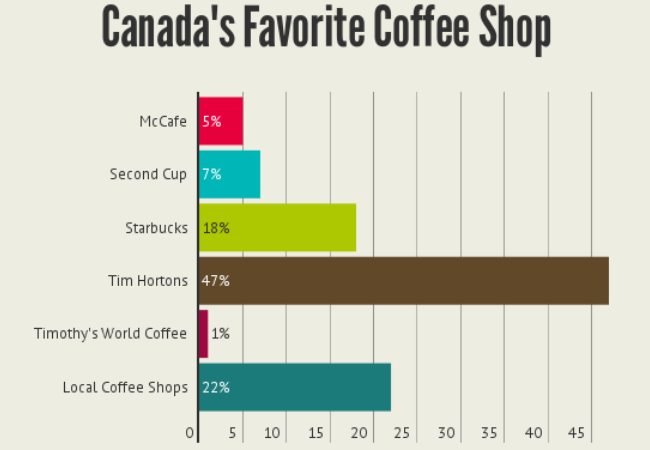 Canadians have many choices when it comes to choosing where to get that next cup of Joe. In some cities, you seem to have a choice on all four corners of an intersection. Location trumps the list with quality of coffee, quality of food and quick friendly service close behind. Having a drive-thru, comfortable atmosphere, the ability to have a meal and good internet round out the list of what’s most important. Stay tuned as our next step in this quest to better understand Canada’s coffee habits will be on how it is enjoyed at home. This data was gathered using a quick and simple task on Twentify’s mobile insights platform. If you have a need to collect field data quickly, cost effectively and dynamically, send us an email at sales@twentify.com. There is power in harnessing Twentify’s expansive user base to get things done.